Under Armour has always prided itself on the science and technology that goes into its sports apparel. But, let's be honest, the company could spend four times as much on R&D for a shirt as HTC did on the One, and it would still never generate the same fanfare. Sure, a heart rate monitor and app still aren't going to set the tech blog world on fire, but it could be the move that earns the company the respect it deserves. The Armour39 system combines a small Bluetooth LE-enabled pod with a distinctive chest strap and an app that tracks your level of exertion, awarding you WILLpower points. What the system isn't, however, is a "lifestyle" product or an "activity tracker." Under Armour is clearly going after those who fancy themselves athletes. Obviously, the question is whether or not the sportswear company has anything valuable to offer in the space. Does its new training platform actually encourage you to push yourself harder and is it really anything more than a FuelBand with an extra dose of testosterone? The answers are exactly where you'd expect them: after the break. The Armour39 exercise tracker is a solid self-quantifier for those that consider themselves athletes. But we wish the app had more features and polish. How would you rate the Armour39? Interestingly, as a heart rate monitor, the Armour39 strap and pod aren't really meant to be seen, yet they still sport a rather unique appearance. Instead of sticking with the one-piece, all-black design that companies like Polar favor, Under Armour laced its strip of elastic with aggressive yellow accents. Waves of yellow emanate from the black plastic well at the center where the data-tracking bug lives. The band is little more than a strip of elastic, but the sensor-laced pads are much softer than those on models from other companies. It's a small touch, but one that lends the product a dash of luxury. And we'll be honest; "luxury" is not a word we ever thought we'd associate with a heart rate monitor. Our one gripe about the design is the closure, which has you slipping a loop of elastic around one end of a plastic hook. The problem is, that hook sits far over to one side, making it awkward to reach. Its placement also pushes the slide to adjust the size of the strap around to the back. That means you'll be doing a lot of twisting and turning to ensure you've got the right fit, especially since it can be quite stiff the first few times you put it on. The "bug," which actually houses the tracking hardware, along with the Bluetooth radio, a small amount of storage and a watch-style battery, is also bright yellow with the signature U and A logo emblazoned on it. That logo hides a small LED that glows blue when attempting to connect to the iOS app and slowly pulses green to let you know everything is good to go. Orientation sensors determine how stressful a particular position is, so it can differentiate between running on a treadmill and doing planks. The onboard memory also means that you can put your phone down and walk away while exercising and still keep tracking. 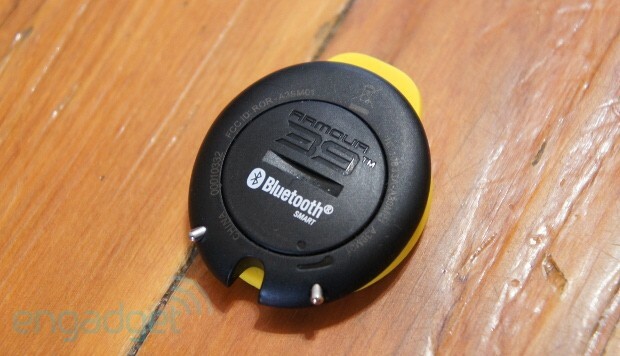 When you wander back into Bluetooth range, your progress will automatically be updated. A tab on one end ensures that you'll insert it correctly and makes it relatively easy to pop out of the strap. There is a bit of resistance as you try to pry it free, which is actually reassuring since you don't want it to come loose as you're sprinting or doing burpees. Under Armour assures us that an Android app is in the works, but wouldn't specify when we could actually expect a release. For now you'll need an iOS device, one with Bluetooth 4.0 specifically. Either that or you'll need to get your hands on the companion watch, which is not yet available and offers only some of the functionality that the app does. That being said, the Armour39 app isn't exactly drowning in superfluous features. It does one thing: monitor your level of exertion, and it does it relatively well. Still, whether or not its busy blue-and-yellow interface conveys that data in the most efficient way possible is up for debate. And we're both confused and frustrated by the fact that it's not optimized for the longer screen of the iPhone 5 or latest-generation iPod touch. Armour39 feels like the genesis of a great product, rather than the culmination of a long R&D process. The first step in getting your new fitness-tracking system up and running is to use the guided-assessment tool. The 10-minute program (for which you'll need a treadmill or a track) is hosted by Todd Durkin, the owner of Fitness Quest 10, a high-end gym in San Diego where a number of professional athletes train, including Cy Young award-winner Jake Peavy and Olympic gold medalist Shaun White. The way it works is quite simple: you start cold then slowly ramp up the intensity of your run to get a measure of your resting and maximum heart rate, while the app monitors how quickly it climbs. Then, at the end, you're directed to come to a complete stop while a final set of measurements determines how quickly you recover from high levels of exertion. There's not much else to the app, however. You take the assessment, then start working out. You can set a WILLpower target, but that's about it as far as advanced features go. At the end of your session you're presented with a workout summary that gives you not just a WILLpower score, but also your average and peak heart rate, your average intensity, duration of your workout and the number of calories burned. Additional tabs break down your heart rate and intensity over time in bar graph form. The data is great for number nerds, but there isn't much you can do with it. Armour39 has no social aspects and, despite your workouts being synced online, there is no robust web app for digging deeper into your results. In fact, you can't even just use the app to quickly check your resting heart rate or delete a workout. You've got to connect the bug and initiate a workout before the app will spit any data out at you. 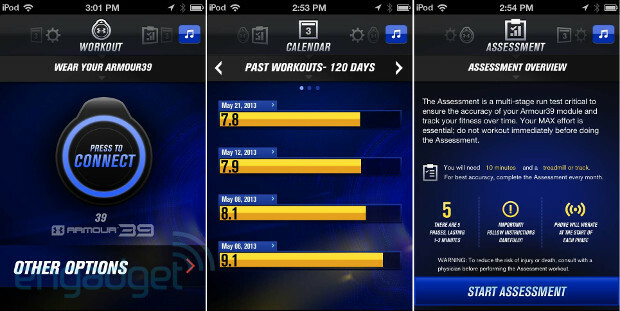 Like Nike+, Fitbit or Jawbone Up, Armour39 is meant to motivate you by quantifying your activities. The difference is, Under Armour isn't pitting you against anyone but yourself. WILLpower isn't meant to impress your friends and the system isn't intended for people who like to brag to their buddies about how fit they are. It's a way for someone who considers themselves an athlete to attach a score to their level of effort at the gym. Obviously, the effectiveness of the WILLpower system will depend on the particular user. For someone like me, who couldn't care less about how many steps he takes, but does want to know if he's really pushing himself as hard as he can on a run, Armour39 works well. 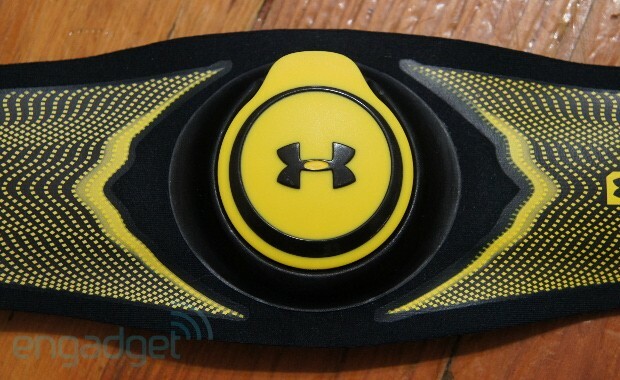 However, if you're looking for something that's going to count your calories and monitor your overall level of activity, Under Armour has nothing to offer you. The problems begin with the price tag: $150 is exceptionally expensive for a heart rate monitor, even one with some advanced hardware features. If the accompanying software were mature and robust, we might be a little more forgiving of the price. Being limited to newer iOS devices is already a significant knock against Armour39, and the fact that the app isn't even properly optimized for the latest generation of Apple handsets (which were already five months old at the time of its announcement) gives us serious pause. Ultimately, Armour39 feels like the genesis of a great product, rather than the culmination of a long R&D process. The company has identified a gap in the market, with a potentially large consumer base, but the combination of price, limited compatibility and a basic feature set undermine its chances of success.